Kero Kero Bonito have come a long way since their rise in fame through memes. 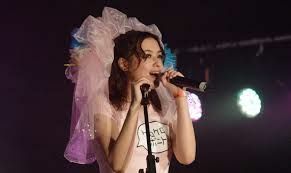 From their track “Flamingo” to their full-length album “Bonito Generation”, they have gained traction and success through their many influencers, such as J-Pop, dancehall, and video game beats. It’s why I found it extremely peculiar when their new EP dropped a few months’ back and I discovered that they had abandoned their cute J-Pop sound for a grunge indie rock aesthetic. I wasn’t completely against the idea. In fact, I really dug some of the new tracks. While their sound was different, the soul of the band remained intact. Their new album “Time ‘N’ Place” arrived back in October and aside from maybe alienating some of their fanbase, I am very pleased with this ‘rebirthing’ of the band. KKB’s sophomore is more melancholic than its predecessor with a more raw and messy sound to boot. It also packs a sense of maturity and vulnerability that they haven’t really explored in earlier projects. Their writing and themes in the past had a more childlike quality which worked well with their poppy positive sound. It was cute, gimmicky and very sweet to the ears. However, “Time ‘N’ Place” strays away from this aesthetic but not for the sake of distancing themselves with their previous identity. Instead, this change is more of a natural evolution within the band based on personal matters going on in their lives: “fellow KKB members experienced some life-changing upheaval, including the loss of several close family members. So, when the London trio began writing again, they felt compelled to diverge from the carefree sensibilities of their early work. For KKB the urgency of “Time ‘N’ Place” was imperative—they needed to process their pain and confusion in frantic, kinetic movements, and bashing away on drums and guitars felt more fitting than assembling songs on a laptop” (excerpt from a Polyvinyl Records interview). The album covers topics such as old, distant memories, forgotten dreams, the passing of time and the hardships of adult life. What was once a dose of teenage nostalgia has now turned into a melancholic trip through the nightmare that is adulthood. There are many examples of grim and existential writing within “Time ‘N’ Place”. For example, in the track “Time Today”, the lead singer, Sarah, is unsure about her future as she grows older and feels her youth fleeting. As she tries to be productive with herself during the day, she dissociates with the world around her and is unable to do anything worthwhile. Once the sun sets and the day ends, she grows despaired that she’s wasted her time. The clock resets for the next day and the cycle of paranoia repeats again. Even though KKB are known for their radical positivity, it’s clear that the band have a lot more to express than just happy-go-lucky songs. They have vulnerabilities like everyone else and sometimes it’s important to let the world know about them. “Time ‘N’ Place” is my favorite album of the year and a personal one for me. Adulthood is a terrifying experience and an inevitable one. It’s why I find Kero Kero Bonito’s album so captivating. Knowing everyone goes through the same motions can be reassuring despite our individual hardships. Even with the revealing nature of the album, the childhood lyricism and positive outlook of the band still shines through the cracks of depression from time to time. It helps bring a nice balance to the record and retains the essence that is Kero Kero Bonito. It reinforces their themes of growing up and plowing through hard times, to never give up and that happiness is just around the corner. Cheesy as it is, it is a nice way to mix up the album. There will be more bad than good in life with many ups and downs, but if you keep swimming against the waves, the end will be worth it.